While the benefits of good oral health may be obvious to a dental professional, the connection between oral health and overall health might not be so clear to your patients. 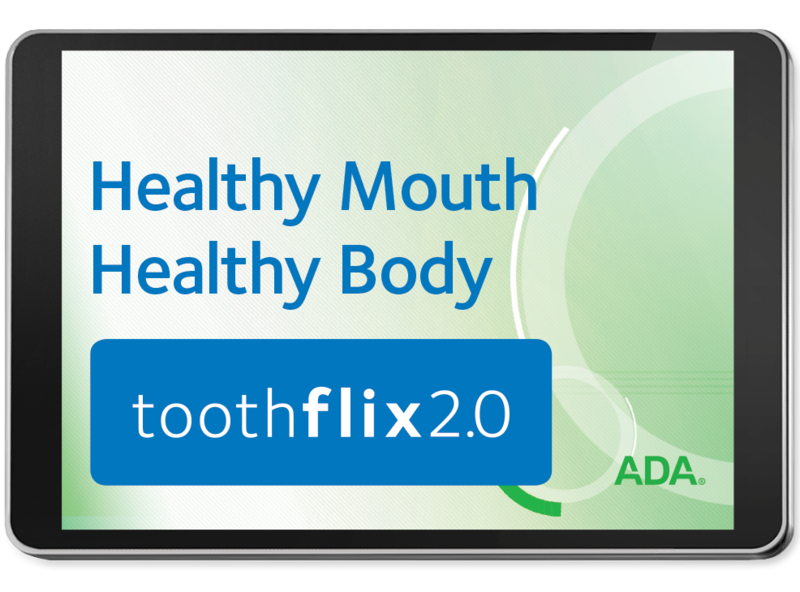 With ADA’s updated Toothflix® 2.0 dental patient education video Healthy Mouth, Healthy Body, you now have the opportunity to present this information in an engaging and entertaining way. Plus, this new streaming version gives you the flexibility to show it as needed, from any web-enabled device. This video educates patients on the connection between periodontal disease and an increased risk for heart disease and stroke. Those with nicotine addictions and diabetes are also presented with the benefits of maintaining proper dental care and scheduling regular office visits. Each Toothflix 2.0 video is packed with up-to-date content that adheres to ADA’s standards for clinical excellence – and by purchasing this video, you’ll have instant access to that content through your online ADA e-Bookshelf no matter where you are. For more information about our Toothflix 2.0 line of videos, visit ADA.org/toothflix. Help promote health habits in your patients by purchasing your copy of Healthy Mouth, Healthy Body today!